This principal broker course is for out-of-state licensees to become an Oregon principal broker. Visit OnlineEd for more Oregon real estate courses. The Oregon principal broker license is equivalent to a broker license in most states having salesperson and broker licenses. Oregon has brokers and principal brokers, not brokers and salespersons. The Oregon principal broker license is required to supervise other licensees or yourself. To qualify for an Oregon principal broker license, the applicant must have three years of active, licensed real estate experience as a salesperson or broker, either in Oregon or another state. When experience is from a state other than Oregon, it must be documented through a certified license history obtained from the licensed state(s). Oregon requires the principal broker license applicant to meet both its broker and principal broker pre-licensing educational requirements. This means applicants will need to complete the 150-hour real estate broker pre-license course and the 40-hour Brokerage Administration and Sales Supervision ("BASS") course. Upon completion of both principal broker courses, the licensee will be eligible to sit for the Oregon principal broker licensing examination. The applicant is not required to sit for the broker licensing examination. *Please note: Audio is available only for the broker pre-license section. The principal broker course is not available in audio. 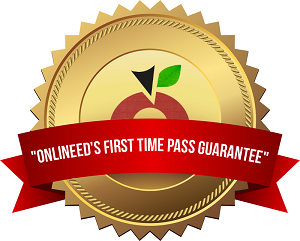 Upon enrollment, you will be attached to an OnlineEd Designated Certified Course Instructor. Each OnlineEd Certified Course Instructor is an Oregon resident, licensed as Oregon Higher Education Coordinating Commission vocational instructor, approved as an instructor by the Oregon Real Estate Agency, an Oregon licensed real estate principal broker, has been awarded the CDEi™ (Certified Distance Education Instructor) by the International Certified Distance Education Certification Center; and was rigorously vetted, approved, and trained by OnlineEd to meet our requirements for online course instruction and receive our designation of Certified Course Instructor. If your course expires, you may extend it for one-time only. Extensions are for 120 days from the date of the end of the original enrollment period (not from the date the extension is requested) and must be accompanied by the applicable extension fee. If you withdraw from the course or request a refund, and then want to continue the course, you must enroll in the course again, at the current catalog price, and start over from the beginning. Should you have a medical emergency, death in the family, or other extenuating circumstance that prevents you from completing your course during its enrollment period, you may petition the School Director for a one-time Extenuating Circumstance Extension Fee Waiver. Extenuating Circumstance Extension Fee Waivers are not automatic, are at the option of the School Director, and should be directed to the School Director's Office at: schooldirector@onlineed.com.